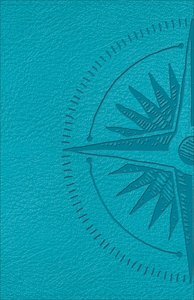 About "CSB Heart of God Teen Study Bible Teal Compass Design"
:Every passage in the Bible tells us something about who God is, who we are as those created in his image, and what God's purpose is for us and for the world. By reading it, we learn to discern his heart. When we know his heart, we begin to think in line with his purpose. This Bible provides teens with the tools to get to know God better. God's purpose in giving the Bible to us was to establish, nurture, and grow a relationship with us. With this teen study Bible, young people will grow in their personal relationship with God and learn to discern his heart in the constantly changing circumstances of life. Mark L. Strauss (PhD., University of Aberdeen) is professor of New Testament at Bethel Seminary in San Diego. He is the author of The Davidic Messiah in Luke-Acts; Distorting Scripture? The Challenge of Bible Translation and Gender Accuracy; Luke in the Illustrated Bible Background Commentary; The Essential Bible Companion; and Four Portraits, One Jesus: An Introduction to Jesus and the Gospels. He has recently completed the The Gospel of Mark for Expositor's Bible Commentary and is writing The Gospel of Mark for the Zondervan Exegetical Commentary. His professional associations include the Evangelical Theological Society, the Institute for Biblical Research and the Society of Biblical Literature. He is a frequent preacher at San Diego area churches and has served in three interim pastorates.